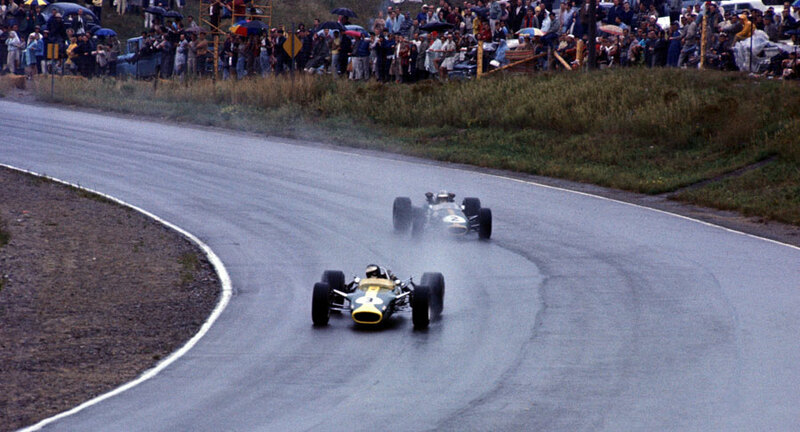 Jack Brabham won the inaugural Formula One Grand Prix at the challenging Mosport Park circuit in Canada, cutting the championship lead of team-mate Denny Hulme, who finished second, to nine points. The race was believed by many to be a one-off as it proved very unpopular with the teams, sandwiched as it was between two European grands prix, something that caused huge logistical issues for them. Several local drivers completed the field, but one - Tom Jones, who had only turned up on the Saturday - lapped almost 25 seconds slower than anyone else and was sent away by the organisers. The sombre mood following the death of the popular privateer Bob Anderson, who had been killed practicing for the race at Silverstone, was not improved by the weather, with heavy rain turning the dangerous track into a skating rink. It was the familiar sight of Clark, Hill and championship leader Hulme on the front row of the grid. Hulme took an early lead with Clark second and Brabham third, before Bruce McLaren - driving in his own car - recovered from a spin to climb in to the top three, and then with his car working well in the wet conditions he passed Clark for second place. The rain soon stopped though and as the track started to dry Clark was on a charge which took him past the two New Zealanders and into the lead. But then it started to rain again and Clark's ignition box failed forcing his retirement. A number of cars pitted with soaked engines, or ones choked with grass and sand after off-track excursions, but many were able to resume after drying out. As Clark retired, Brabham scythed past Hulme, and so it was Brabham who took the rain-soaked victory ahead of his team-mate with Dan Gurney third. Graham Hill finished fourth ahead of Mike Spence in the BRM and Chris Amon in the Ferrari. Having already changed his battery on the grid, losing six laps, Al Pease spun and stalled out on the circuit during the race, and suffered another flat battery. He ran back to the pits for a new one, ran back to the car, fitted the battery himself and continued. He was still running at the finish, albeit 43 laps down on the winner.